Immersive Experiences must deliver both brand impact and results. IX is the key to creating long lasting deeper bonds with tomorrow’s customer. But IX must be driven by a strategic framework in order for it to deliver to the business metrics, brand strategy and customer needs whilst creating competitive advantage in the market place. In the brave new world of interactive advertising, delivery of authentic and coherent IX is critical to engaging and retaining the new customer. Successful brand IX is defined as a brand's ability to mentally & emotionally immerse a customer in deep purposeful brand story worlds which build trust and longterm loyalty through the orchestration of the senses using technology & narrative. DrIving Advocacy through IX Meaning. 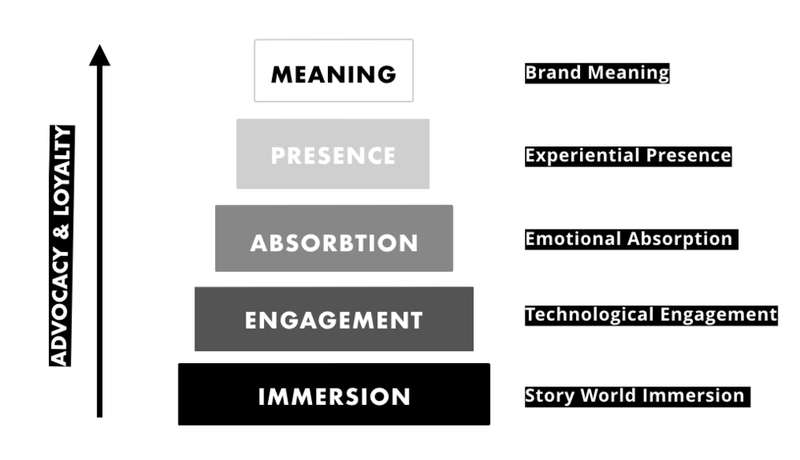 Immersive brand experiences engage and absorb customers in the brand narrative, giving them a unique participatory role in the world of the brand and connecting with them on a deeper level to develop meaningful relationships.